WHAT DID STRIKE ACTION ACHIEVE? The action on 30th November demonstrated the massive support of our members against the Government’s attempt to impose changes to our pension scheme. 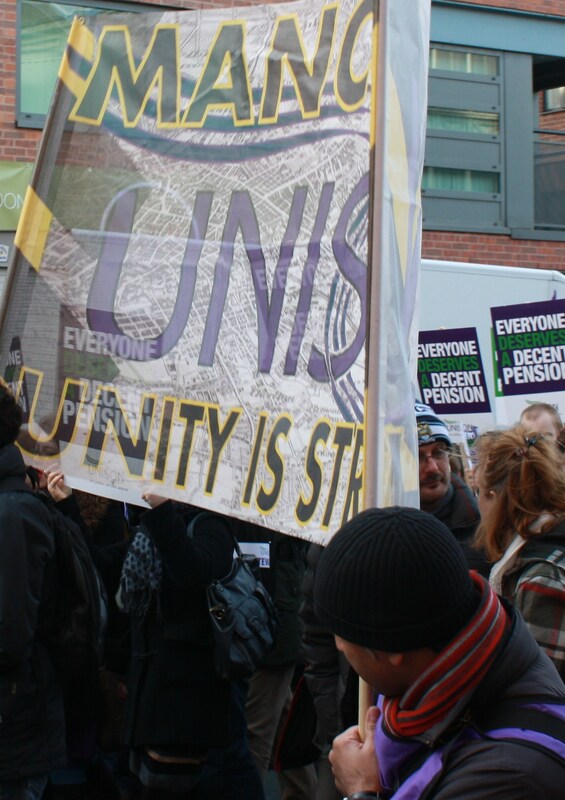 The Branch congratulates all those who took part in the action which was so well supported that almost 90% of Manchester Council staff were recorded as officially on strike not counting those who were on leave, ill or exempted. In effect well over 95% of all workers supported the action. Similar support was evident in Manchester College and other employers. The national action resulted in the Government backing off making any changes to our current Local Government pension until April 2014. Proposals to make workers pay 50% higher contributions from April 2012 till at least April 2014 have been dropped. There is a planned re-evaluation of the LGPS which dependant on the outcome may result in proposals for increases in contributions from 2014 but that will relate entirely to the value of the scheme and not any Government agenda. Anyone within 10 years of normal retirement age will be protected in respect of any future changes to our pension scheme. Additionally, those between 10 and 14 years of normal retirement age will receive a form of tapered protection. Proposals to impose a new pension scheme have been withdrawn to allow negotiations and consultation with members on any negotiated alternative scheme. Government intended to deny our members who may be transferred outside Councils the right to stay in the pension scheme. That has now been stopped. 25% of members in the scheme are already employed outside Councils by employers who have ‘Admitted Bodies’ status with the scheme. Apart from protecting those members in the future so they can retain their rights UNISON will be seeking regulations to be amended to allow more employers to join our scheme in the future. HAS UNISON GIVEN UP THE OPTION TO TAKE FURTHER STRIKE ACTION? The UNISON industrial action ballot result remains live and the dispute position remains until and unless any agreement is reached. UNISON does not have to re-ballot and can call further strike action if negotiations break down or the outcome is not worthy of putting to members. If members reject any final outcome of negotiations UNISON can call for further strike action involving consultation with regions and branches without the need for a further industrial action ballot. WHO DECIDES ON ANY ALTERNATIVE SCHEME TO COME INTO EXISTENCE FROM APRIL 2014? Whilst there will be discussions on a possible revised pension scheme, no new scheme will be agreed by UNISON unless it is supported by a majority of members in an all-member ballot. WILL THE FUTURE SCHEME BE A CAREER AVERAGE SCHEME? The Government are seeking a CARE scheme in the future but UNISON will not agree one unless it is comparable and at least as valuable to our members as our current final salary scheme which remains in place. No Career Average (CARE) scheme will be agreed other than by all members in a ballot. WHAT HAS BEEN AGREED NATIONALLY? “This SGE applauds the action taken by UNISON members and other public service trade unions on 30 November 2011 to force the government into serious negotiations over public sector pensions. We also note that the results of UNISON’s ballot resulted in the improved Reference scheme/offer from the government. This SGE notes that the action has given rise to the potential for detailed LGPS negotiations directly between the unions and the Local Government Association (LGA) which recognise the unique features of the LGPS and its membership. We also note that those negotiations would take place on the basis of no change until 2014 and suspension of the formal DCLG consultation over employee contribution increases and accrual rates, the outcome of which will otherwise be implemented on 1 April 2012. This SGE recognises that UNISON is still in dispute with the government and employers and that our ballot results are still ‘live’. The National Local Government Service Group and all the other Service Group Executives with membership covered by the LGPS have all now agreed to enter detailed negotiations. These negotiations on any possible new scheme are due to take place immediately with a view to completing the process by the end of April 2012. The motion, agreed by the Local Government Service Group Executive, provides the basis for a responsible and democratically accountable way to proceed with negotiating over the LGPS from a position of status quo, with the ultimate decision on any new scheme resting with an all-member ballot. Points 2, 3, 5, 7 and 8 of the SGE motion explicitly reserve our position on the details of any proposed changes and ensure lay member involvement, communication and consultation throughout, a membership ballot and reinforces the position that our industrial action ballot mandate remains live should we need to call further action. These explicit points address the primary concerns expressed by our Special Branch Executive on 4th January 2012. Our Branch and the North West region in voicing our concerns contributed to a position that going forward can enable maximum unity in supporting our negotiations to pursue UNISON’s campaign objectives. WHAT ABOUT OUR COMMON LINE WITH OTHER TRADE UNIONS? UNISON is continuing to work with all other public sector trade unions wherever possible to achieve our common objectives. A minority of unions appear to have decided on a principle not to engage in negotiations on behalf of their members and not then put any outcome to their membership with a view to taking further strike action should the final proposals be unacceptable. But none of those unions are currently committed to taking strike action on any particular date so their position is unclear as if they are not negotiating nor naming dates for strike action it would appear that it is left to UNISON and other unions to carry out all the negotiations without their participation. UNISON will nevertheless attempt to work with all public service trade unions to achieve our joint goals but attempts by parties outside our union to seek to influence our internal democracy are regrettable and unhelpful. The key decisions around any proposals directly affecting UNISON members are for our membership to decide within our own structures. WHAT IF TALKS BREAK DOWN? UNISON can call on members to take further strike action, that option remains available throughout the negotiation period. The Branch will regularly send information and updates to all stewards and work contacts. If any workplace does not have a steward, now is the time to elect one. Our Branch website will also regularly be updated as news becomes available. Where requested Branch Officers will, wherever possible, attend any workplace meetings.